Dr. Eli Fischer, Founder of Fischer Pharmaceuticals Ltd., a manufacturer of health and hygiene products and drugs, won the prize during the 2016 Board of Governors Meeting. 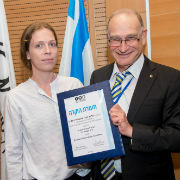 The Prize, which honors the late Hugo Ramniceanu, a longtime President of the French Friends Association, is awarded annually to distinguished personalities in the Israeli business world. Prof. Klafter welcomed Ramniceanu’s daughter, Dr. Monique Barel and thanked her for her support through the years of the prize and scholarship. He also praised the French Friends as “models of social responsibility” for their support for scholarships for needy and immigrant students at the University. Dr. Fischer donated his prize money to two medical students: Yamit Jennifer Cohen and Hagar Malcov, both in the Direct PhD Program for Outstanding Students and from the Department of Genetics and Biochemistry, Sackler Faculty of Medicine. A scholarship was also awarded to Anna Lerman, a TAU student in economics. 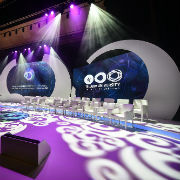 Hugo’s daughter, Dr. Monique Barel, said, “Thirty years ago, when my father founded this prize, the idea of rewarding entrepreneurship and innovation was a revolutionary concept.” She described how her father had fled from Romania to Paris in 1947 to become an accomplished businessman in the textile field. 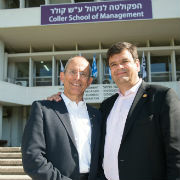 “He helped many Israeli organizations but Tel Aviv University was his favorite. He considered it his third child,” she said. In his response, Dr. Fischer outlined the history of Fischer Pharmaceuticals from its humble beginnings in Bnei Brak 50 years ago into a world-leading global enterprise. Trained as a biochemist, he had promised his mother that he would “work to prolong life,” he said. “Since then we have been trying to slow down the aging process through our products especially, in eye vision products,” said Fischer, whose company has developed over 30 different eye drops, along with sun protection products that are especially adapted to the Israeli market. Dr. Fischer noted that his company was dedicated to the employment of a diverse workforce, including individuals with special needs and minorities. The family also supports NGOs working with children-at-risk and donates products to overseas medical missions. Also speaking were Chairman of the Board of Governors Prof. Jacob A. Frenkel, a past recipient of the Prize and President of the French Friends Association Prof. François Heilbronn.